A simple healthy delicious soup of carrots, onions and spices, topped with lemon honey yogurt. Make the Soup: Heat butter over medium heat in a large heavy pot or Dutch oven until melted. Add onions and cook for 2 minutes, stirring, until translucent. Add cumin, chili powder and 1 1/2 teaspoons salt. Cook, stirring for 30 seconds or so. Add carrots and water. Turn the heat to high. As soon as it comes to a boil, lower heat and simmer, covered, for 20 minutes. Puree soup with an immersion blender or if using a food processor or blender, puree in batches. Stir 1 tablespoon honey and 1 tablespoon lemon juice into soup. Season, to taste, with salt and pepper. 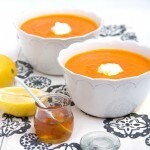 To Serve: Serve soup hot with a heaping tablespoon of lemon honey yogurt for each bowl. Sprinkle with a pinch of cumin and a pinch of lemon zest, if you like.